Orlando native James Frazier created an opportunity for fans to engage and support the victims of the tragic attack on the LGBT nightclub Pulse. 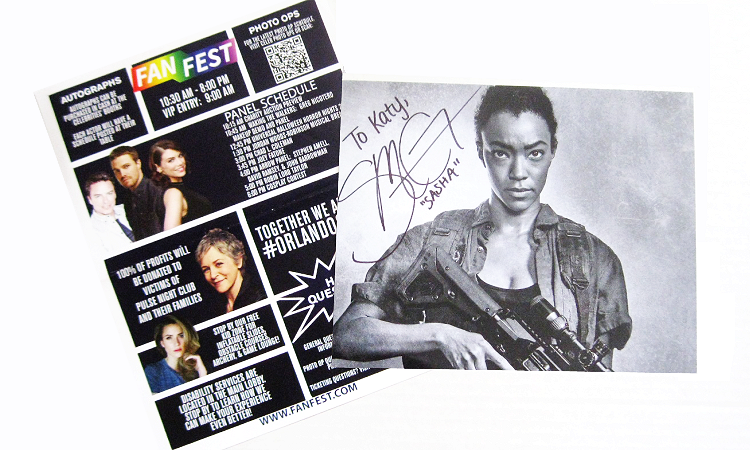 As the creator of the WalkerStalker cons, he immediately reached out to actors to create a fundraising event FanFest Orlando. Actors like Stephen Ammell (Arrow), Robin Lord-Taylor (Gotham) and The Walking Dead such as Melissa McBride and Lauren Cohen were in person to sign autographs and be apart of photo ops. 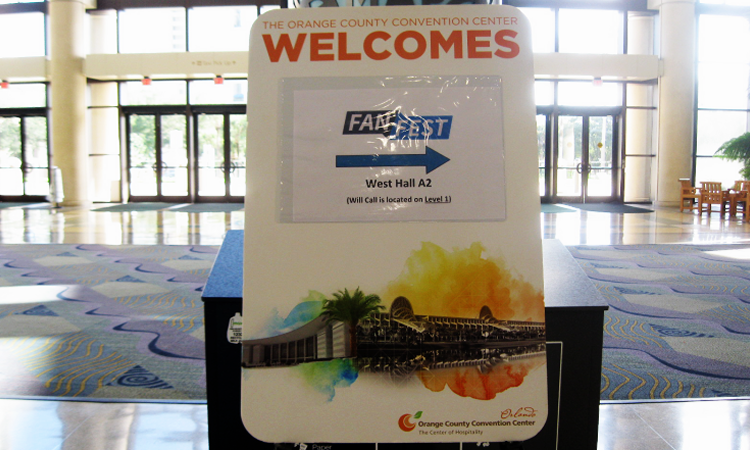 The day also offered free panel sessions, merchandise, a cosplay contest, and a charity auction. 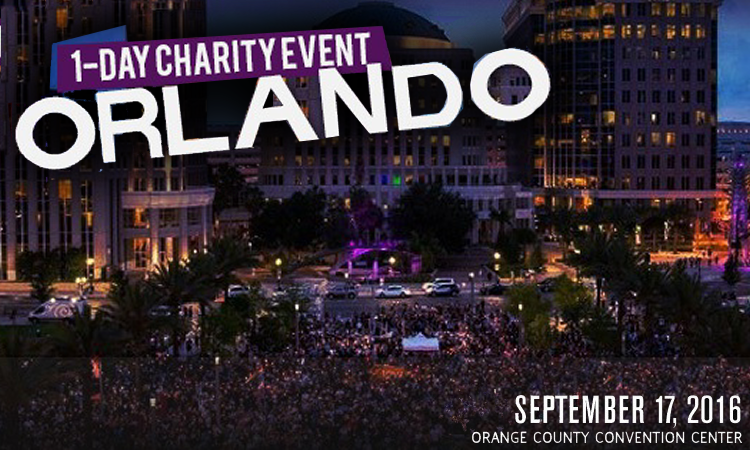 One hundred percent of the profits raised from ticket sales, autographs, professional photo ops, and vendor sales will be donated to the One Orlando Fund. Support a good cause for Orlando and have the opportunity to meet stars from my all-time favorite show? Sign me up! It was truly something I couldn't miss! 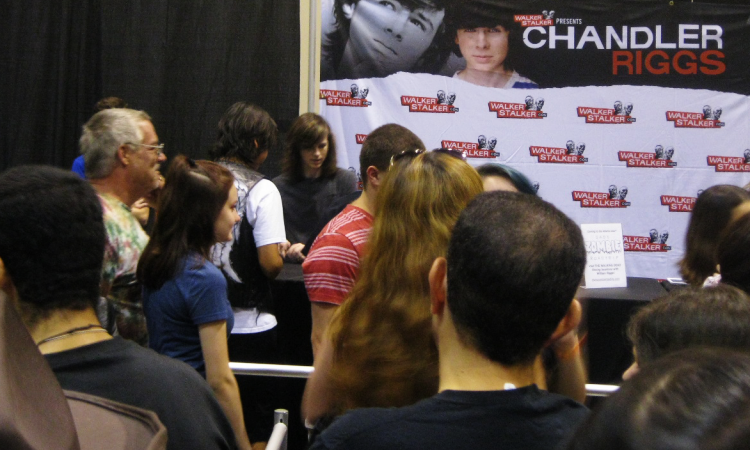 This was my first time attending a Walking Dead event, so I didn't know what to expect with autographs or taking photos. As General Admission, the lines were pretty long but well-organized and nothing a little patience couldn't handle. All of the volunteers were very helpful and enthusiastic. My only qualms was WalkerStalker Cons' regulations with The Walking Dead actors regarding photos was a little tricky and pricey. These are pretty much set for all of their events. Photos with the actors at their booths are considered selfies. Professionally taken portraits called Photo-Ops were available at designated times. Both ranged from $40 to $80 depending on the actor. On top of which, photos from within the actor's queue were prohibited too. There's a lot to consider with actors, their autographs, and taking pictures like how much time they have for signings and what is up to the actors/agents discretion. It's totally understandable that snapshots with every single person isn't time-effective and is also up to the actors' personal space. However I just wished the selfie with your own phone/camera wasn't as much as the professional photo. To be able to take at least some candid photos while waiting in line would've been a nice opportunity to have, and it was something I overheard fans were disappointed about. Me and my sister's first priority was Melissa McBride, aka Queen of the Apocalypse Carol Peletier. She's been the one I've been talking about meeting non-stop, and we didn't want to take a chance on her line, though we assumed many of the lines would be just as popular. For her, I donned a Carol-esque sweater much like her Suzy Homemaker persona in Alexandria. 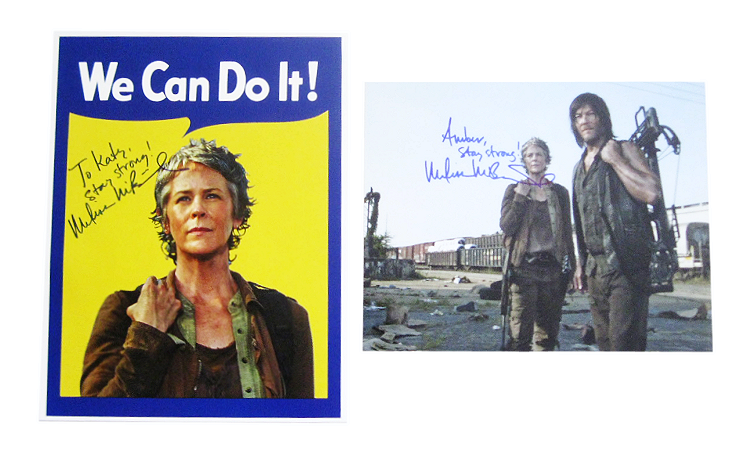 Inspired by the Rosie the Riveter banner from World War II, and Carol's strength growing throughout the series, I made the photo above on the left for her to sign. People hanging out in the line got a huge kick out of it, which made me less nervous to ask her to sign it. I pretty much spent the entire time going on about how we were about to meet her for an hour and a half. It was amazing to finally thank her for being at the event and how much Carol/her inspire me. She was so kind and lovely, and a bit introverted as expected from her interviews. With every autograph, she's very diligent and takes her time. Fans are also able to personalize what they'd like her to write on a post-it note, so my sister and I chose a simple "stay strong". Afterwards, I really couldn't believe my month long, technically six year wait, to meet her came true! So many actors from The Walking Dead turned up for the event. Their commitment, passion, and excitement was truly stunning. Several queues never seemed to lighten their load. If the actors weren't in Photo Ops, they were churning out autographs. They were all upbeat, compassionate, and giving with their time, which lent a truly enthusiasm energy for the con. Sonequa Martin-Green as Sasha is one of my other (several) favorite heroines from the show. I couldn't miss meeting her! Martin had a genuine warmth and love that radiated throughout the queue. I could've hung out at her booth all day - honestly. I didn't really know I would start inwardly freaking out until I was right in front of her. Her entire attention is on every single person she talks to, and was genuinely moved by the fans' support. It's almost like you're in your own universe with her. She took my hand between hers and greeted me with a huge smile. My sister was with me, and Sonequa was stunned to find out we weren't twins. We talked about how family was important, and somewhere along the line I gushed about how much I love what she does with Sasha and what a great well-rounded and strong character she plays. Next up was Chad Coleman who playedTyrese. Throughout the convention a few men cosplayed as Rick, and one of them was ahead of us in Chad's line. This guy was in character the entire time imitating Andrew's hand and head movements, talking in a Southern accent, and gingerly tapping his (empty) gun holster. He and his daughter who dressed up as Carl walked through the con linking hands similar to the escape scene in No Way Out. It was awesome, and unfortunately, wasn't able to catch up with him to ask for a picture. The wait for Chad, like the others, was worth it. He is such a big ball of soulful energy. We mostly talked about his character and scenes with Melissa. He said he loved his time on The Walking Dead but was really looking forward to playing a villain on Arrow. My sister got her photo taken with him and checked getting a hug from off her bucket list. Our last stop was Ross Masquand who plays Aaron allowed simple meet and greets. He has a lot of energy chatting with everyone and dishing out hugs. 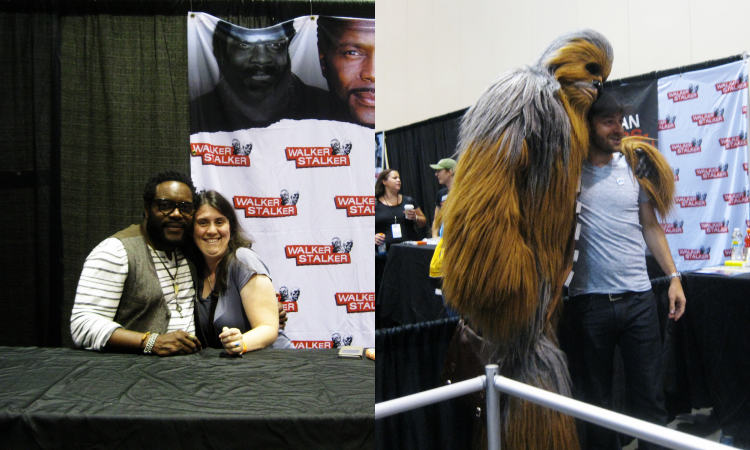 HONESTLY, of all the people including Melissa and Sonequa who I was just in awe of, I was sooo star-struck with Ross. Usually I'm just nervous but can manage at least a few sentences, but the second he said "Hi" and pulled me in for a hug, I was like "......". He liked my Carol-esque costume. I believe I said something about Aaron and his celebrity impressions, and my sister told him I can do impressions too, like Matthew McConaughey. He bent down a little to hear me say, "All right, all right, all riiigght". He laughed; told me it was perfect. After thanking him for being at the event and he hugged me again, and then I pretty much bolted. I had no idea what to do but he was so nice (and is a lot taller in person). A few actors we managed to get a peak of included Michael Cudlitz (Abraham), Lauren Cohen (Maggie), Chandler Riggs (Carl) and Emily Kinney (Beth). Every time we stopped by their stations, the line was insanely long (which we understood but were amazed by! ), or we just missed them before Photo Ops/much needed breaks. But it was still really cool to be so close and yet so far. Talking to other fans and seeing cosplayers reminded just how big this fandom is, which is something I often forget about on the internet. One of my favorite memories will be spotting an awesome child cosplayer as Carl walk by as we were standing in line to get into the con. Automatically, I shouted Coooraaall which made him smile and added a skip in his step. Inadvertently, I started a Coral chant all the way down the line behind me. The actors also re-enforced how much this whole fandom and the cast is one big family. All of them were as fascinated to meet the fans just as much as we were to meet them. I'm so looking forward to AMC Walking Dead marathons to say "Omg, I met them?!?!" To be surrounded by the fans and stars, where love was celebrated to support a good cause, was something I'll never forget. I'm so grateful to do my own little part to contribute to OneOrlando and have this wonderful experience.